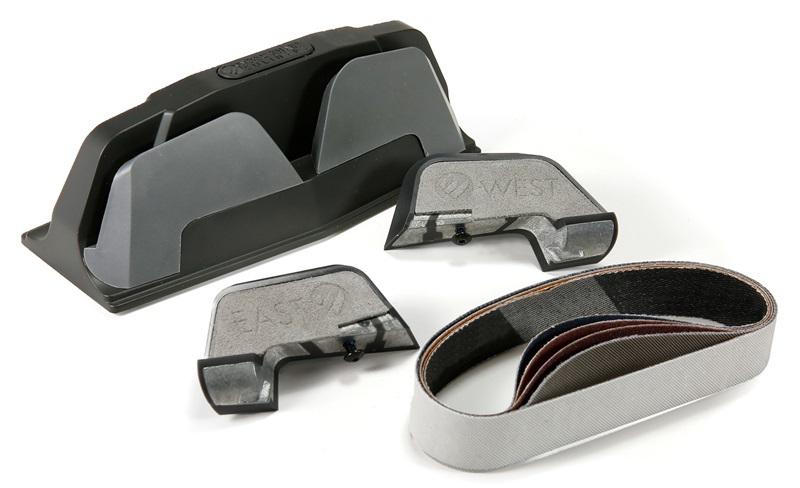 The E5 Upgrade Kit adds flexibility to the E5 Premium Knife Sharpener. Two sets of Precision Angle Guides allow for lower or higher angles. Five Abrasive Belts in Four grits provide for aggressive repair to fine finishing. The Precision Guides included with the E5 are set at 17°, which is a general-purpose angle. The E5 Upgrade Kit includes two additional set of guides. One at 15° for eastern style knives, and one at 20° for western style knives. These East and West Guides give you different options for different knives. The Guides snap into place and a storage tray is included for keeping them organized when not in use. The E5 comes with 3 Standard Red Coarse Abrasive Belts. The E5 Upgrade Kit has 2 replacement Standard Red Coarse Belts, and also expands on them by adding 1 Blue Extra Coarse Belt, 1 Grey Medium Belt and 1 White Fine Belt. Specific "recipes" are included for using combinations of belts and guides to get optimal results. Q. Will the belts for the Work Sharp Culinary E5 Knife Sharpener fit other Work Sharp sharpeners? A. No. The Belts for the Work Sharp Culinary Knife Sharpener are specifically designed for the tension and flexibility requirements of this machine and are not recommended for use on other Work Sharp sharpeners. Q. Will the East and West Guides work on the Work Sharp Culinary E3 Sharpener? A. No. The East And West Guides are usable only on the Work Sharp Culinary E5 Sharpener.